Avathara Sthalam of Poigai Azhwar & Swami Desika. The idol of Lord Atthi Varadha made of fig (atthi) wood is kept inside the pushkarini and is brought out only once in 40 years and kept for darshan for ten days. Garuda seva here is very famous. As per sthala purana, Brahma conducted yagna here (Ka-Brahma, Anjitha worship) and hence called Kancheepuram. Pleased with the yagna, the Lord granted a boon and hence the name Varadaraja. 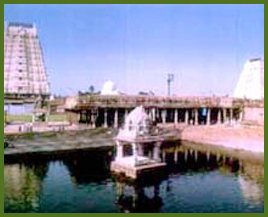 Kancheepuram is considered very holy by Vaishnavaites as this place helped in propagation of Sri Vaishnavism. Theertham - Vegavathi, Anathasaras, Sesha Theertham, Varaaha Theertham, Brahma Theertham, Padma Theertham, Agnikusala Theertham. The Garuda Seva in this Kshetra, which is conducted annually in the month of Vaikasi(May-June), starting in the star of Thiruvonam is very famous all over the world. The Sanctum Sanctorum runs to about 1200 ft in length and 800 ft in width. A 100-pillared mantap in front of the sanctum sanctorum is very famous. The Kshetra is accessible from the Kanchipuram Railway station which is situated en route Chengelput - Arakkonam Railway line. Access to the temple This temple is Chinna Kanchipuram. The Moolavar of this this sthalam is Sri Varadharajar. 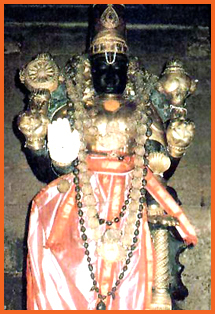 Other names of the Perumal are Perarulalan, Devathirajan, DevaPerumal. Moolavar in Standing position facing his thirumugham towards West direction. Prathyaksham for Brighu Muni, Naaradhar, Aadhisesan, Brahman, Gajendran.